Utilities can come along and dig up the streets without warning – for emergencies. I am rather baffled how such an emergency can result in nobody working on the problem yet holding up the traffic for days. BT need to come forward and explain themselves. In other news, we have a good amount of ticketing going on following encouraging commitments from the police. I saw four police officers today in the town centre! The local Superintendent Mike Ismay apparently himself issued over 20 tickets on one afternoon last week and had to go back to the station to get some more because he ran out…. Gordon Brown will no doubt be writing to me to thank me for the extra income (we the Council don’t get it, nor do the police). This entry was posted on July 5, 2007 at 12:23 pm	and is filed under General, Maidenhead, Police. You can follow any responses to this entry through the RSS 2.0 feed. You can leave a response, or trackback from your own site. David your stance on tackling the parking problem in Maidenhead should be applauded. In fact let me shake your hand next time I see you parking in the Nicholson’s walk car park, or let us share a smile and a chat when we are both queuing to get into the short stay car park at Grove Road. Perhaps you would like to borrow the correct change as well because that short trip into town would cost you £1 otherwise…..what?…oh I see you have a parking space do you? Oh of course, you get the same benefits as the other council workers….free parking at the town hall and if that is full, a little bit of inconvenience but you can use your council workers pass to park in any of the other car parks around town. I think its time that the parking debate should include a question as to why council workers do not pay for parking, take up hundreds of spaces in the town centre car parks, and force everyone else to park illegally if they want to nip into town!…..don’t you?………no I don’t suppose you do! A few good points laced with good estate agent sarcasm! Firstly we are wanting to increase the number of free on-street spaces by reviewing the double yellow lines. 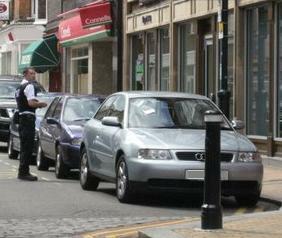 This will happen in conjunction when the Borough takes over the enforcement early in 2008. Secondly the on-street parking spaces are not provided for the convenience of business owners, rather, to try to get customers to visit the businesses. Some business owners may think that it would be perfect to simply park outside their shop window all day but if everyone did that there would be nowhere for anyone else to park for a quick shop! Thirdly, we did have proposals for the better use of the Town Hall site in 2000-2003 but as you might have noticed the townspeople rather rejected them (and we paid a heavy electoral price). Fourthly, although most councillors do not have a parking space, as Leader I do happen to have the use of one – but in fact, _I_ pay for my parking on a monthly contract basis rather than abuse my privilege. A hint of sarcasm perhaps and I would concede that perhaps my comments were misdirected if you and the other councilors do indeed pay for contract parking. That said however, I am sure that does not extend to the rest of the employees at the town hall many of whom use the Grove Road car park as an overflow when the “reserved for employees” town hall car park is full, further reducing the parking options available. I will look forward to seeing those proposals you mention, and if you do add to the number of free parking spaces then I would welcome that, but I think its more likely that what will end up being proposed is very limited options for anyone wishing to pop into town because actually, parking fines are a good money earner for a council. If that were not the case then you would see the revenue generated being ploughed back into reducing the cost of parking around the town and this will not happen will it?! You talked about paying a high political price for your proposals in 2000-2003, personally I believe that was as much to do with national view of the Conservative Party at the time as opposed to anything you were proposing locally. Well that and the fact that the Town Hall is considered an iconic building perhaps. If you really want to prove to everyone that your proposals are for the good of the community as you seem to be claiming in your editorial piece in last weeks advertiser, then be open and honest about where the money raised in fines is going, and what as residents of Maidenhead, we are gaining by them. If you do not do this then believe you me, if you thought that you paid a high price over the Town Hall proposals you will pay a bigger one for over zealous traffic enforcement officers operating around the town. In response to your point about business owners parking around their offices. This would be fair were it not for the fact that actually we also pay for one space per mobile employee that we have, both with the council and private parking both at the spiritualist church and the football club. what we do have though is the farcical situation though where our council permits do not guarantee spaces, they merely pay for the use of a space. If you have to go out during the day the space is re sold hence the requirement to park around the office especially when going out on appointments as the car park is invariably full when you wish to return to it. Finally i appreciate the time you took to reply, but at least I spared you having to debate this on the letters page of the advertiser! It’s not the use of fines per se it’s the fact that people who park on double yellows are causing either congestion or safety issues – the lines are not there just to annoy citizens (at least not usually!) and flouting of the law may be OK for some – but I prefer order to chaos. I am sure you would not want a big van parked in front of your door all day (like cars sometimes do at Motorworld). Finally when people park illegally they are depriving the local taxpayers of car park income, which in turn has to be made up through the Council Tax – this year we’re predicted to be several hundred thousand down and the illegal parking is part of that problem we are anxious not to burden the taxpayer with! I live in Queen St and I find parking a nuisnce at the best of times.Every single 30 min slot is taken up by business pretty much all day long,Phatz and the Fast food delivery drivers being the major culprits.The thing that really annoys me though is that I am required to pay to park in the Car Parks overnight when they are empty.Therefore I park in one of the slots on Queen St or try to find one else where.This may have changed since I last enquired at the town hal(I was told as an advantage card holder I would get reduced rates at night)The Towns car parks should be free between 18:00 and 08:00hrs thus encouraging people to visit the town at night and not park on the pavements I.e The Broadway. I am a resident on Cordwallis Road. I have no off street parking and no space to create any (neither have my 2 neighbours). There is a single yellow line outside our houses, which isn’t consistent with streets in the immediate area, so we have nowhere to park during the day since these restrictions have started being enforced. We had quite happily parked outside since we moved here without causing problems. No-one from the council can tell us why the lines are there and keep telling us that they will be reviewing the situation in March. I cannot understand why the council has introduced a scheme without solving the issues first. In the meantime I have to walk a great distance with my 5 month old baby to avoid getting a parking ticket. It is ridiculous.